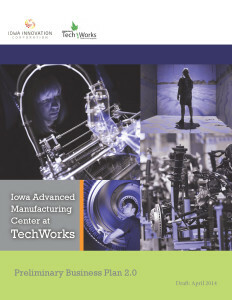 Iowa Advanced Manufacturing Center Conceptual Business Plan | Vandewalle & Associates, Inc.
A shifting global economy is changing the way business plans are conceptualized and applied to economic development-driven projects. Vandewalle & Associates has been active in developing a number of these Conceptual Business Plans: “working” plans that build unique, viable business concepts and economic development around the assets of a region. In addition to helping structure and test innovative new business models, these plans are essential to the process of building consensus, defining costs, and providing the revenue structures that become touchstones as the concept develops. A conceptual business plan will undergo repeated market testing, adapting to meet market conditions and accommodating new opportunities. 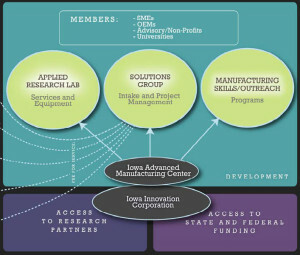 The Iowa Advanced Manufacturing Center (I-AM Center) is one such project. Working with the Economic Development Authority, Vandewalle & Associates helped to craft an innovative vision for building collaboration and propelling the state’s vast supply chain of manufacturing employers into global competitiveness. Here the I-AM Center helped co-locate a network of industry, technology and applied research partners in a setting and forum designed to grow, focus and deliver the region’s R&D, talent, and investment resources where they are needed most. The I-AM Center further acts as an innovation hub and recruitment tool for the best and brightest makers and young entrepreneurs, as well as for established companies seeking comfortable, flexible space in a collaborative setting.